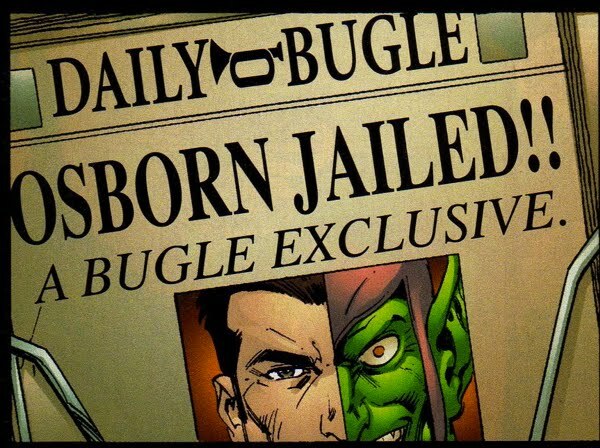 Norman Osborn's ruthless and unethical ousting of his business partner Mendel Stromm from their shared company is undoubtedly a pivotal event from his past. But one key detail of that scenario has either been completely ignored or, at best, inconsistently written over the years. What is that key detail you ask? Well, it's simple...the company's name! In this section of the Goblin's Hideout, I'll examine the history behind the infamous company that Osborn wrestled into his sole possession from Stromm. Surprisingly, for relatively simple detail it's actually a complicated and convoluted task to track over the years. And perhaps the best way to attack this question would be to follow the information as it was rolled out over the years. Amazing Spider-Man #37 featured the first (official) appearances of both Norman Osborn and Mendel Stromm, as the latter was released from a 10 year prison sentence. Stromm sent one of his robot minions to wreak havoc upon Osborn's electronics plant as an act of revenge against Norman's prior transgressions. As evidenced in the panel below, the sign electronic was prominently displayed on the front of the building. This panel suggests that Norman owned an electronics plant as part of his 'company'. To further confirm that fact, the following two sets of panels (both from Amazing Spider-Man #37) corroborate the Norman Osborn-owned electronics plant. Three issues later in Amazing Spider-Man #40, whilst Norman was retelling the origin of the Green Goblin to the detained Peter Parker, he unveils another facet to his business empire. 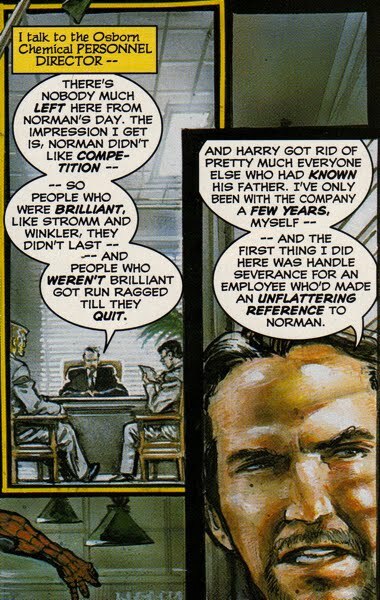 Norman's introspections in the flashback panel below reveal his ownership of a 'chemical company'. Clearly distinguishable from an electronics plant, this 'chemical company' indicates that Norman's empire was quite diverse in its enterprises. This panel from Amazing Spider-Man #47 further supplements Osborn's association with the chemical industry. 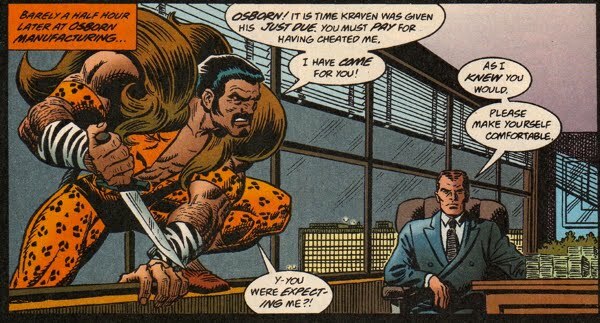 Kraven the Hunter is quite aware of Norman's status as a 'rich chemical manufacturer', despite erroneously viewing Norman as the Green Goblin's flunky. Amazing Spider-Man #61 adds a few more wrinkles to Osborn's business enterprises. At this point in Osborn-history it was clear that Norman was involved in both producing electronic equipment as well as chemical manufacturing. 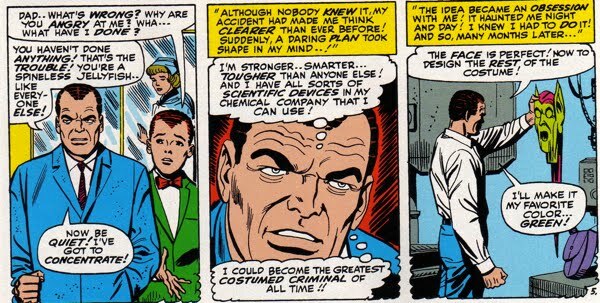 However, in the series of panels shown below Spider-Man finds an electronic device produced in Osborn Laboratories, yet, oddly enough, he assumes that it was made at a chemical factory? Not to be nitpicky, but wouldn't a more logical place for an electronic device to be produced be an electronics plant? 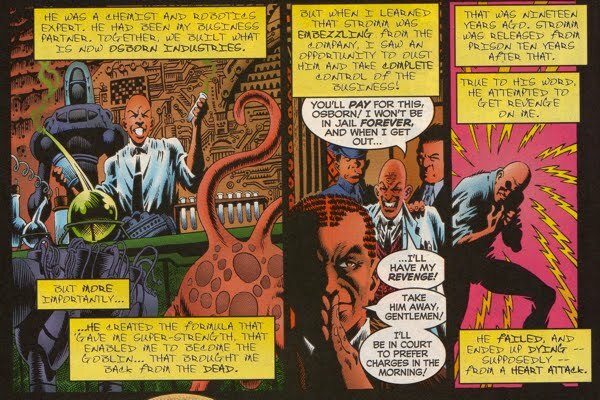 In my opinion, this series of panels represents the beginning of the end for Norman Osborn the electronics mogul in favor of Norman Osborn the chemical mogul. 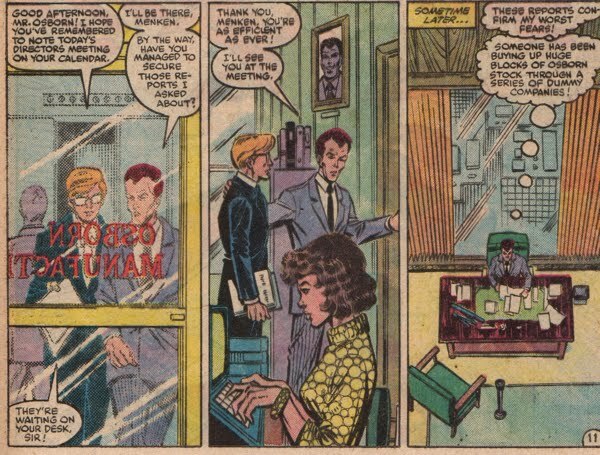 Moreover, this panel suggests that the name of Osborn's company is Osborn Laboratories, why would anyone print something other than the company name on a device it produced? But this must have been a flub in Stan Lee's continuity, because later in this story arc we'll see a different name offered up for Norman's company. Perhaps Osborn Laboratories is a small part of a much bigger company? 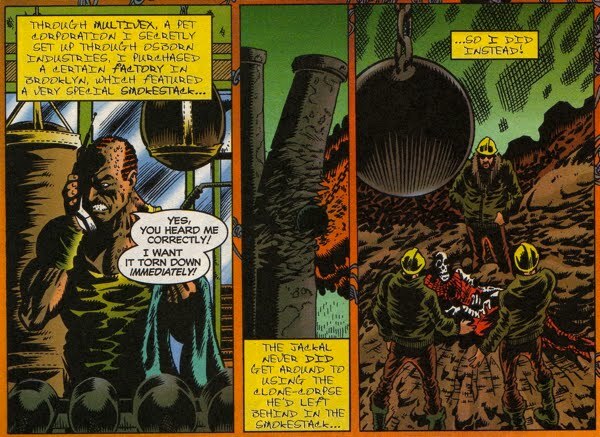 The following two panels, from Amazing Spider-Man #61 and #62 respectively, confirm that Norman Osborn indeed owned a chemical plant. The following panel from Spectacular Spider-Man Magazine #2 is probably the most significant piece of the puzzle from the Stan Lee-era of the Spiderverse. Captain George Stacy provides a name for Norman's company referring to a fire at the Osborn Chemical plant. To be clear, Stacy was not saying 'Osborn's chemical plant' because his follow-up statement is, "the plant owned by our fellow member...", which would be a rather redundant statement if he wasn't mentioning the company name in the prior sentence. So Captain Stacy was providing the name of the company when he used Osborn Chemical as a proper noun. 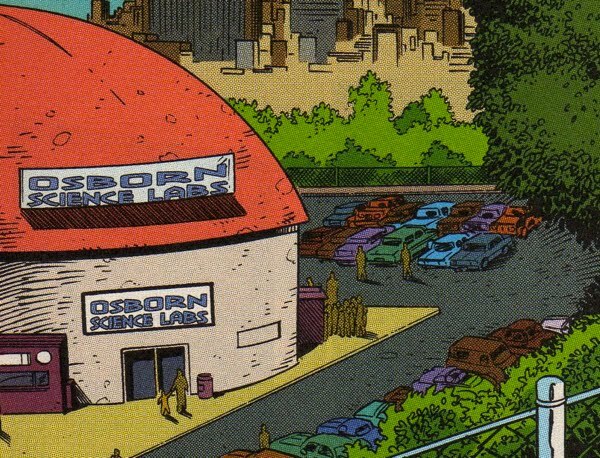 Even though it is left rather ambiguous in this panel from Amazing Spider-Man #66, the sign above the security booth begins with 'Osborn...'. This would jive with the fact that the company's name was Osborn Chemical (although, it would work for Osborn Laboratories as well I suppose...). 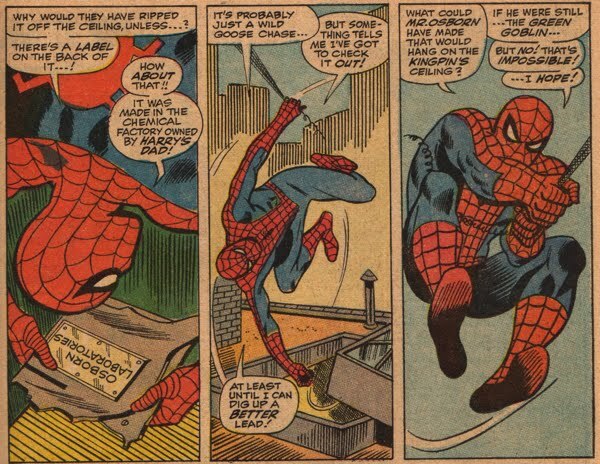 Although not published in 1971, the Official Marvel Index to the Amazing Spider-Man #4, which revisits Amazing Spider-Man #96 with an incredible amount of detail, lists Norman's company as a generic "chemical firm". If the folks that produced this index could not sort out the details behind Norman's company name, than it must be confusing! There's not too much in the following panel to sink your teeth into from the classic Amazing Spider-Man #121 except for the fact that Norman's company was a large enough (and valuable enough) to be traded publicly on Wall Street. Also, this story was written by Gerry Conway, keep that in mind for future reference. Fast-forward ten years and a new era begins, the era of the Hobgoblin. The shift in the prominent Spiderverse-Goblin (from Green to Hob) was matched with a shift in the focus on Norman Osborn's company, more specifically, the shift to Osborn Manufacturing. 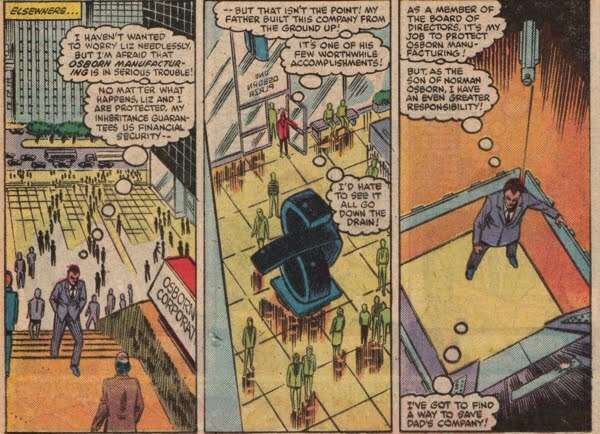 The panel below from Amazing Spider-Man #238 clearly displays a division within Osborn's holdings. 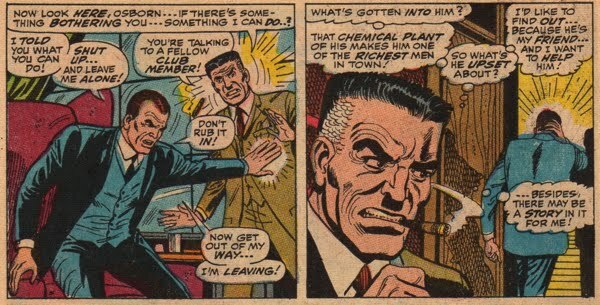 The following flash-back sequence from Amazing Spider-Man #249 refers to Osborn's "control of [his] chemical company". 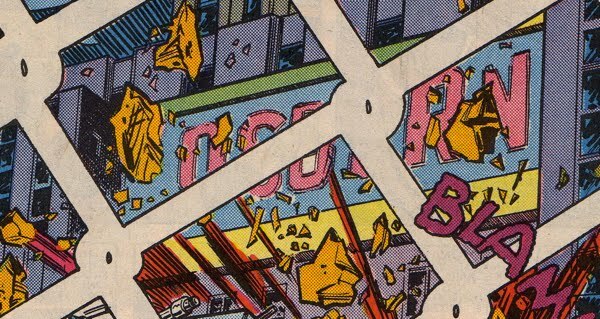 The reason I included this panel is to illustrate the seemingly forgotten aspect of the electronics portion of Osborn's holdings, which was there during his earliest appearances. 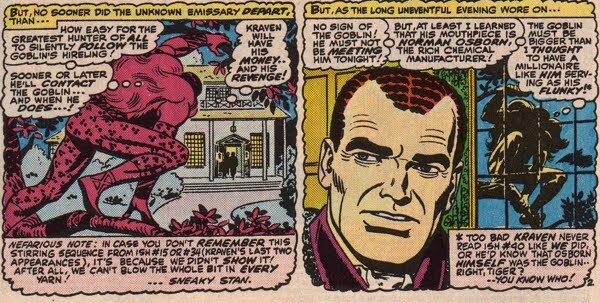 Recall that a similar amount of neglect was seen in Amazing Spider-Man #61. The following sequence of panels from Amazing Spider-Man #260 is chock full of information regarding Norman Osborn's business empire, so much so that I'm going to enumerate it for simplicity sake. 1. Osborn Manufacturing seems to be the centerpiece of Osborn's holdings during this era, implying that chemical production was the chief revenue producer for the company. 3. 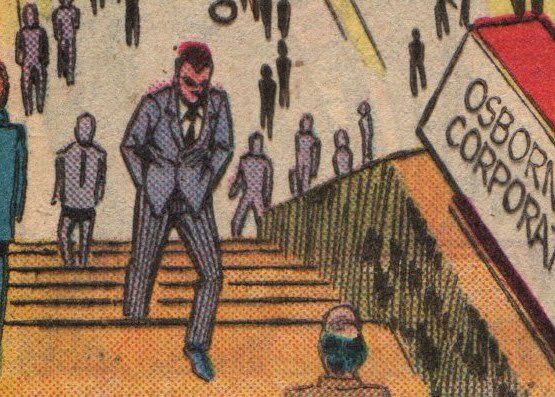 The second panel has an address listed as 'One Osborn Plaza', so the complex which housed the Osborn Corporation was probably pretty large and it paid homage to the man who brought the company to prominence. Also in that second panel there is a large statue that looks to be interlocking letters 'O' and 'S'. A similar artistic rendition of the Osborn company emblem will appear again in the Spiderverse. 4. 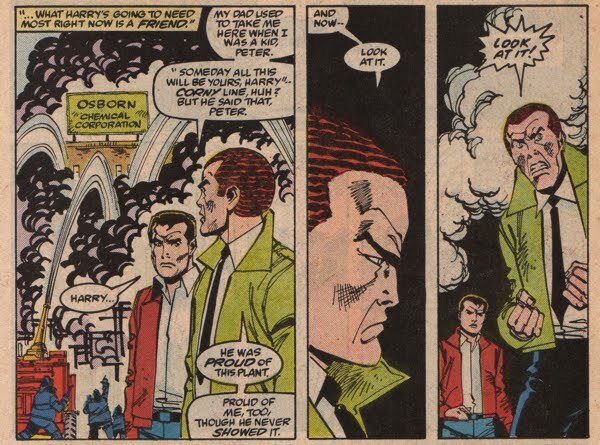 In the last panel Harry refers to 'Osborn stock', it may be safe to assume that he is not referring to Osborn Manufacturing stock, rather the stock of a larger corporation...although that is speculative. 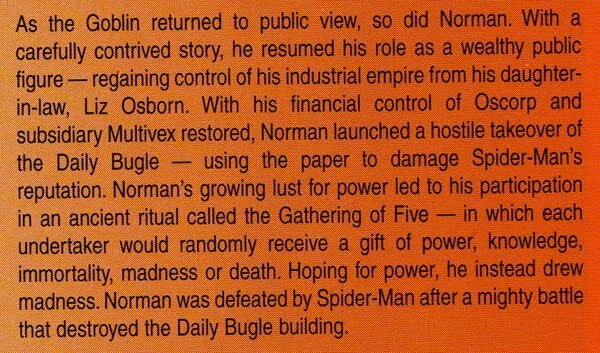 A landmark moment for Osborn's corporation occurred off-panel in 1987 within The Official Handbook of the Marvel Universe Book of the Dead, Volume 9. This is the earliest evidence I could find for the use of the name Osborn Industries, Inc., and this marks the first official appearance of that company name. If there is any one particular comic book that embodies the inconsistent and confusing history regarding the name of Norman Osborn's company, it would undoubtedly be Spectacular Spider-Man #146. The cover (shown below alongside a zoomed-in section) features Spider-Man and Harry Osborn fighting off machinery from Harry's factory that had seemingly come alive. The sign in the background clearly displays the name Osborn Chemical Company. 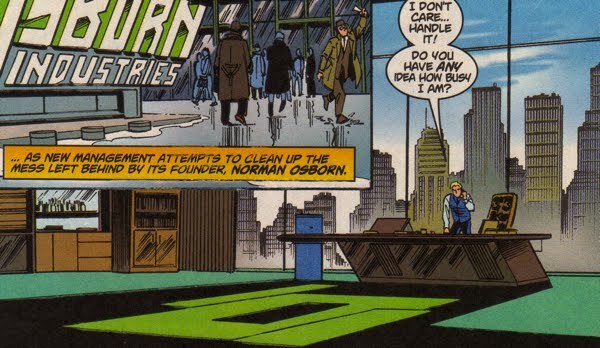 The following panel is also from Spectacular Spider-Man #146 and I'm including it to show that it was not simply a typo in the above panel, the sign once again reads 'Osborn Chemical Corporation'. Beautiful. 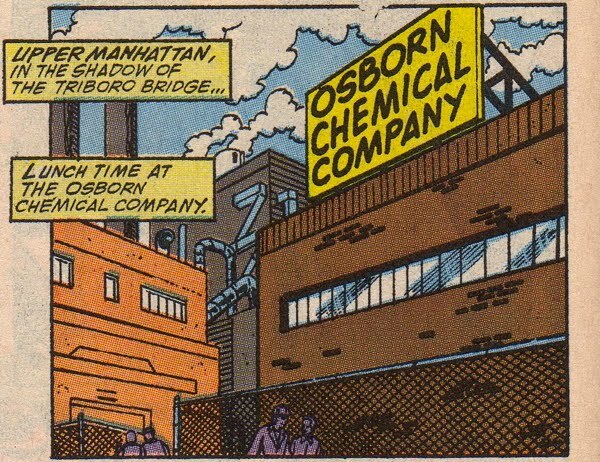 Later that year, Dave Michelinie and Todd McFarlane collaborated for Amazing Spider-Man #312 and they used Osborn Chemical Company as the name. That duo was rather respectful to continuity (for the most part) throughout their shared work, so I would expect the use of the Lee-era Osborn Chemical Company from them. The name 'Osborn Chemical Corporation' was short-lived and Gerry Conway's work Web of Spider-Man title featured the traditional Osborn Chemical Company. The panel below is from Web of Spider-Man #66. 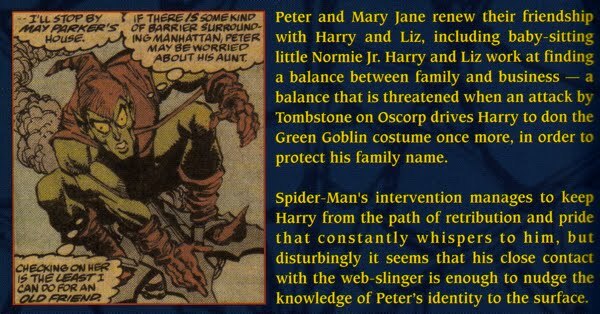 Interestingly, the trade paperback Spider-Man Son of the Goblin (which focused on Harry Osborn's escapades as the Green Goblin) contained a brief summary of Conway's Web of story arc. The creators of that trade paperback did not use the name Osborn Chemical Company, which was used throughout that story. Instead they referred to the company as Oscorp. Why does that matter? Well, this compilation was published in July 2004 and the shift to Oscorp had occurred just two months prior with Brian Michael Bendis' Pulse #2, which was the first in-story use of Oscorp...talk about a rewriting history! 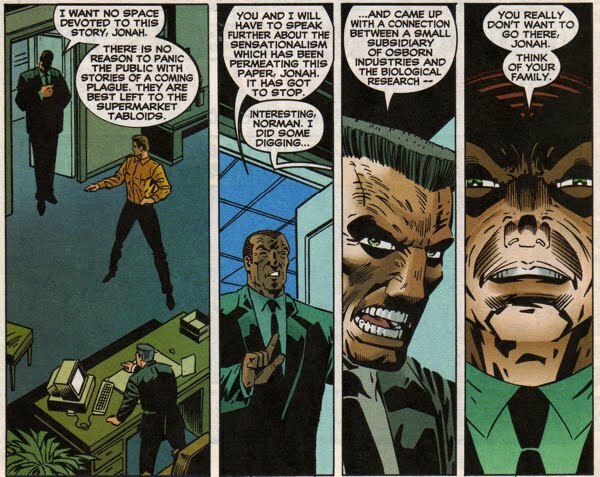 Four years after Conway's story in Web of, J. M. DeMatteis presented the first in-panel use of Osborn Industries when Spidey inadvertently came across an old (and condemned!) building whilst swinging through the city. 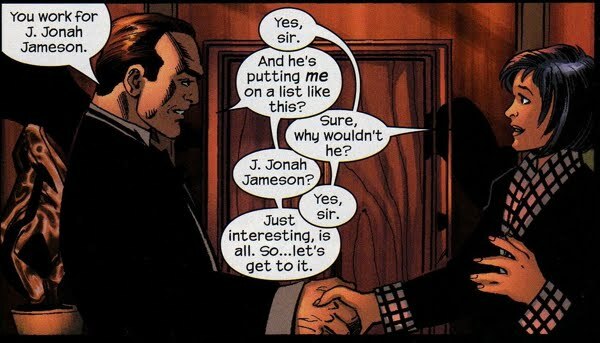 The panel below is from Spectacular Spider-Man Annual #14. 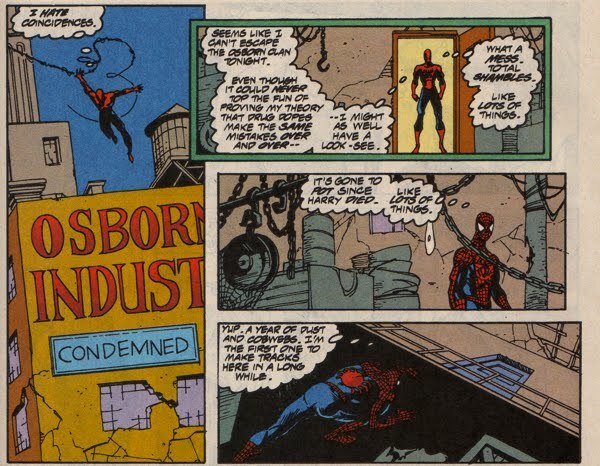 However, the in-panel use of Osborn Industries was short-lived and when Kurt Busiek began working on Untold Tales of Spider-Man, he returned to the Lee/Conway-preferred Osborn Chemical. Although it should be noted that Busiek added the 'Inc.' to the end of the company's title. The panel below is from Untold Tales of Spider-Man #1. In the one-shot Tales of the Marvels: Inner Demons, Marvel scribe Mariano Nicieza and artist Bob Wakelin placed the simple title Osborn on the machinery that was destroyed by Prince Namor during that story. It's not clear what company name they preferred (ie, Osborn what? ), but they were the first to associate the single letter 'O' as the company emblem (as seen on the crane below). 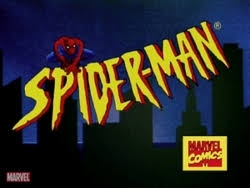 The debut of the cartoon Spider-Man: The Animated Series in late 1994/early 1995 adds another wrinkle to this story. 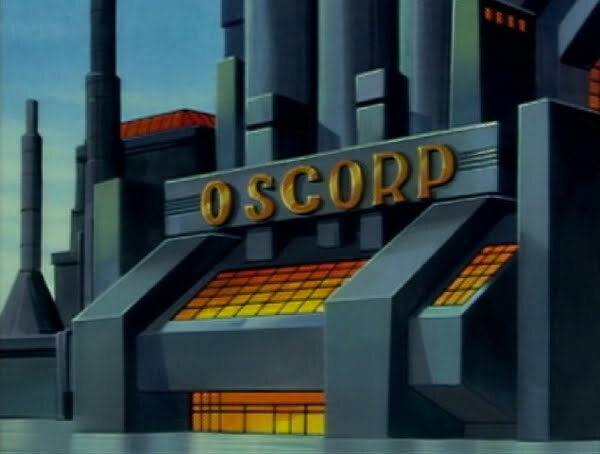 In 1995, the company name of Oscorp is used for the first time, however it occurs in the cartoon, not a comic book. Soon after, a comic book series based on the tv show called Spider-Man Adventures (later titled The Adventures of Spider-Man) which debuted around the same time as the cartoon also used the company name of Oscorp. The panel below is from Spider-Man Adventures #3 (Feb 1995). 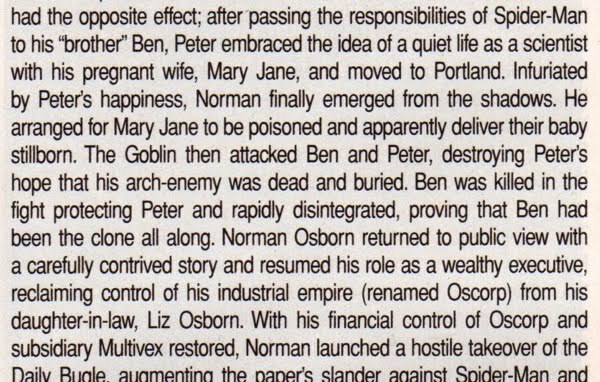 In Kurt Busiek's one-shot Spider-Man: Legacy of Evil, he continued to use the title Osborn Chemical. Busiek deserves some credit for his attention to the continuity of the Lee/Conway era, but still...what about Osborn Electronics?? When Tom DeFalco and Ron Frenz teamed up to produce the Amazing Spider-Man 1996 Annual, they used the same company name that was prominent during the years they first worked on the Amazing Spider-Man title (ie, the Hobgoblin era), Osborn Manufacturing. Which is ironic because this retcon is set back during the Stan Lee-era (~Amazing Spider-Man #50ish) when the most common name would have been Osborn Chemical. Spider-Man Unmasked was an Official Handbook-esque book that was published in 1995. 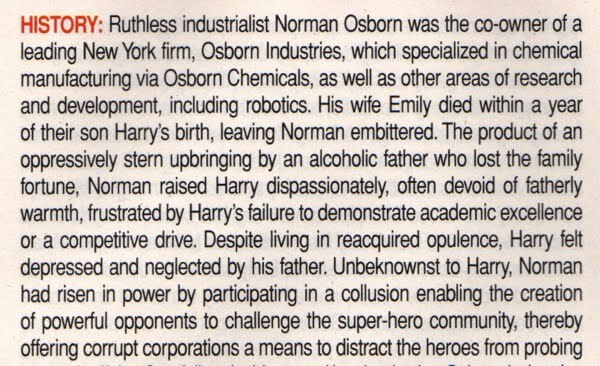 This guide steered clear of providing a name for Norman's company but it did use the infamous moniker ruthless industrialist that has become synonymous with Norman Osborn over the years. , he also clarified some details surrounding Norman's past as well. 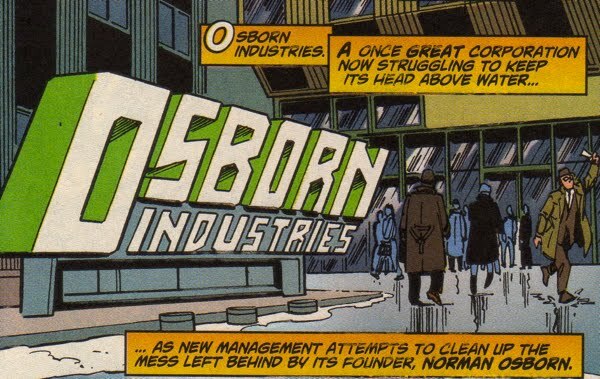 Greenberg used Osborn Industries as the name of the company that Stromm and Osborn co-created (which is technically a retcon). Considering the amount of information and continuity-straightening that came out of that one-shot this is a pretty solid endorsement for Osborn Industries. 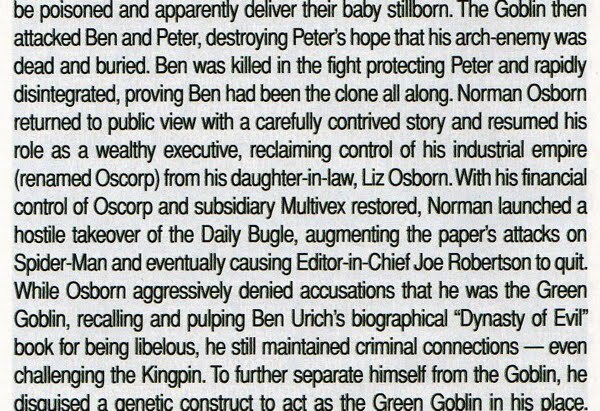 Greenberg also included the infamous Multivex Corporation as a 'pet company' set up through Osborn Industries...good to know. Busiek must have missed that one-shot because he kept things status quo during his flashback story in the Untold Tales of Spider-Man 1997 Annual, utilizing the title Osborn Chemical Company yet again. 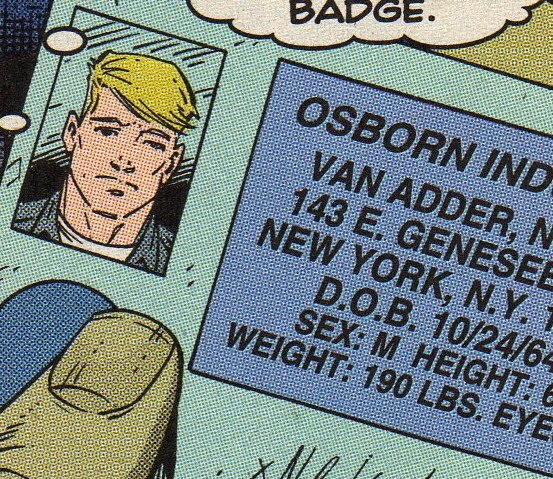 Howard Mackie, in that same year, did not follow Kurt's lead when he wrote Peter Parker Spider-Man Minus 1, instead he used Osborn Industries as the company's name as seen below on Nels Van Adder's badge below. This is not surprising since Greenberg collaborated with Mackie throughout this era. Mackie also included a building named Osborn Science Labs in Peter Parker Spider-Man Minus 1 in which Norman hosted a science exposition for aspiring scientists. It was unclear as to whether this was a purely educational facility or a true research laboratory. 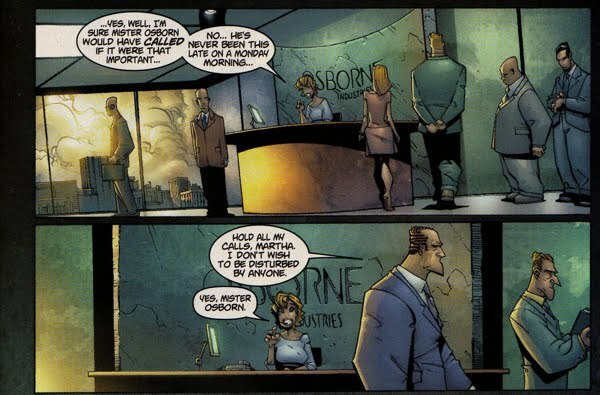 Mackie continued to prefer the title Osborn Industries during this era of the Spiderverse as seen below in panel from Peter Parker Spider-Man #96. John Byrne followed suit with his work in Amazing Spider-Man #441, also using Osborn Industries as the corporation's title. At this point in Spider-history, it was clear that Osborn Industries was becoming the front-runner as the preferred name for Norman's company. 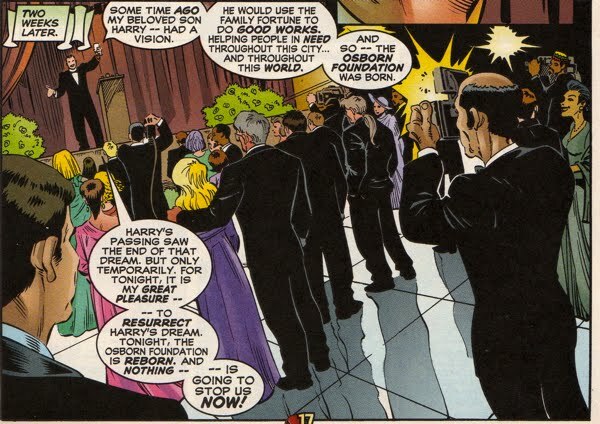 The following panel from that same issue is noteworthy because of the insignia on the floor of the executive office. It resembles the interlocking 'O' and 'S' that was seen as a statue in the lobby of the Osborn Corporation way back in Amazing Spider-Man #260. Although, in this case, the two letters are probably 'O' and 'I'...still, pretty cool. 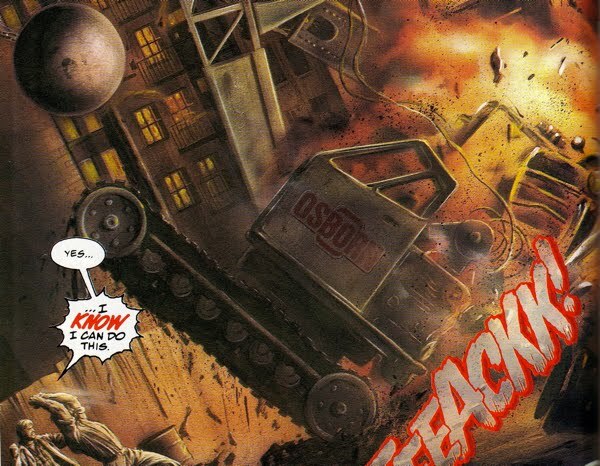 When Paul Jenkins and Humberto Ramos teamed up for the A Death in the Family story arc, they also used Osborn Industries as the company's name, well, they almost did. The Ramos/Jenkins collaboration resulted in one of the more prevalent misspellings of Norman's last name, referring to the company Osborne Industries. 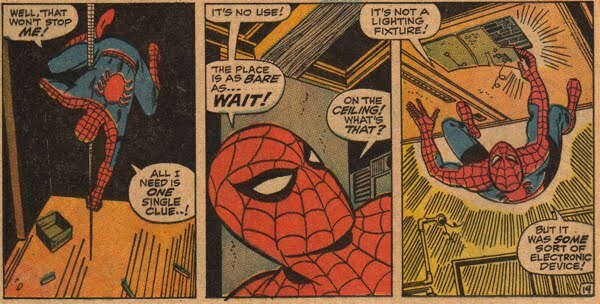 The panel below is from Peter Parker Spider-Man (V2) #47. 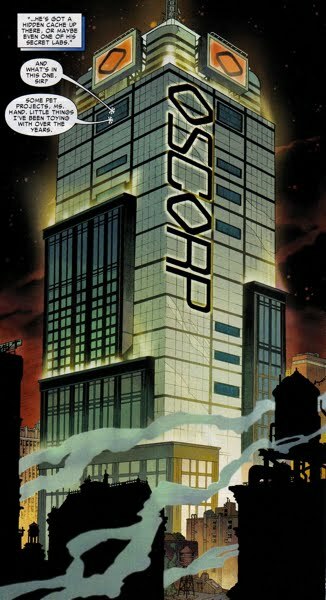 ...Bendis took down one more pillar...he changed the name of Norman's company to Oscorp! It's catchy isn't it? But can a true continuity fiend go for a change like this? I think the answer is yes, at least to me and its for a couple of reasons. Not the least of which being that there was no universally accepted name for the company over the years prior. Yes, Osborn Industries had some steam, but it was a relative newcomer in the grand scheme of things. Moreover, Bendis was not the first to use the title Oscorp, the 1995 Spider-Man Animated series (on Fox) was the first place I can recall ever using that title. I don't know if Bendis was inspired by this show, but from a record-keeping standpoint, the creators of that series were first to Oscorp. So in a weird way, Oscorp was already accepted within the Spiderverse. See the aforementioned reference to this in the "1995" listing above. But this is where I draw the line. The 'Official Handbooks' Marvel produces with regularity have been a valuable source of information for comic book fans over the years. In some cases they provide a necessary segue between story arcs, linking them together when the arcs themselves fail to do so. The problem is that occasionally they goof-up when blending the old stories with the new ones, and in effect, they rewrite history. After Bendis 'created' the name Oscorp, it seemed like the entire Osborn history was rewritten at the same time. The two examples below from the The Official Handbook of the Marvel Universe Spider-Man 2004 contain two screw-ups in the Oscorp saga. The first lists Oscorp as being the name of the company Norman embezzled from Mendel. The second example, lists Oscorp as the title of the company during the infamous Revelations story arc. MARVELLLL!!!!!! How about this one!? You have to love Paul Jenkins and his non-conformist attitude. In the midst of Oscorp-fever, Jenkins stuck with formerly-dominant Osborn Industries during his run in the limited series Civil War Front Line. The panel below from Civil War Front Line #7 represents the last known in-story reference to an active Osborn Industries facility. Okay, back to the 'Official' Handbooks, more specifically the All-New Official Handbook of the Marvel Universe Update #1 that was published in 2007. 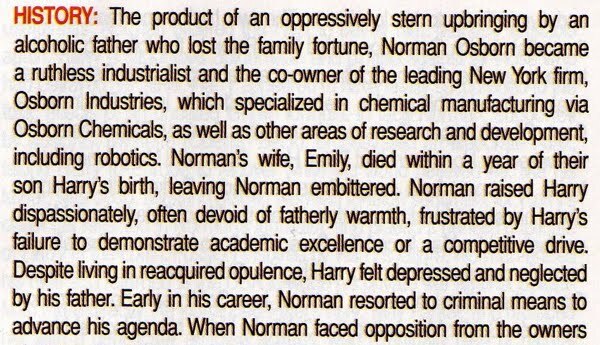 This one is a mixed bag because they did make some corrections from the last Norman bio that was published, but there are still flaws. 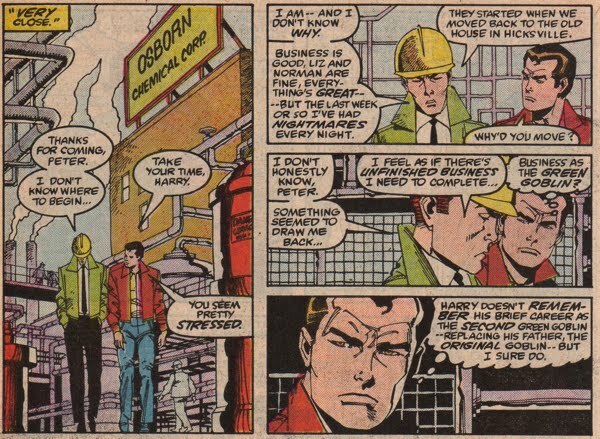 The first panel provides probably one of the best explanations for the convoluted history behind Osborn's business holdings, namely the reference to Osborn Chemicals being a subsidiary of Osborn Industries. But it fails to mention Osborn Manufacturing or Osborn Electronics specifically as companies themselves, instead listing both 'manufacturing' and 'robotics' as specialities. 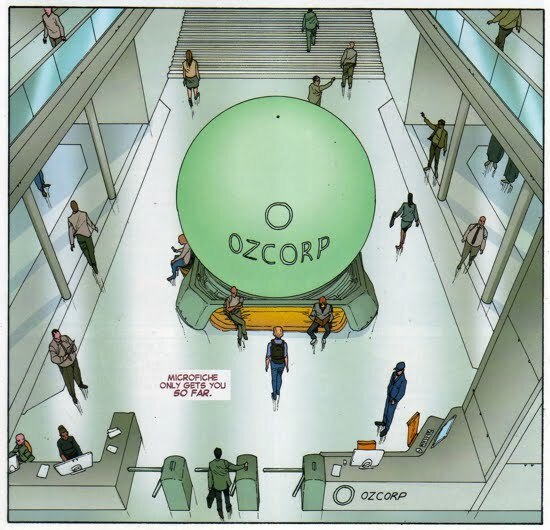 At least they did not refer to this as Oscorp...until the next panel. 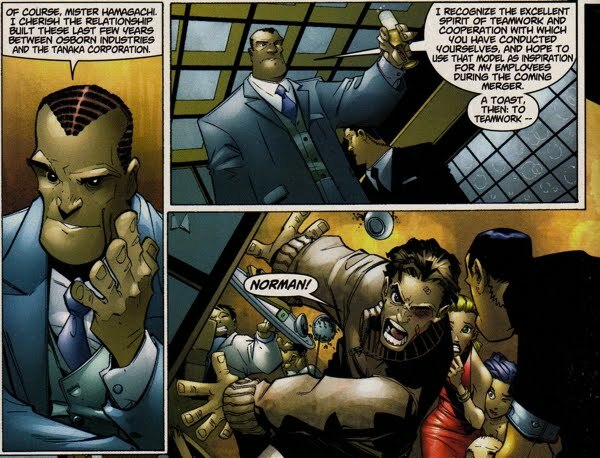 The second panel features the same error made in the last 'Official Handbook', claiming that Norman renamed his company Oscorp when he returned from exile in Europe. We have already shown why that is erroneous. 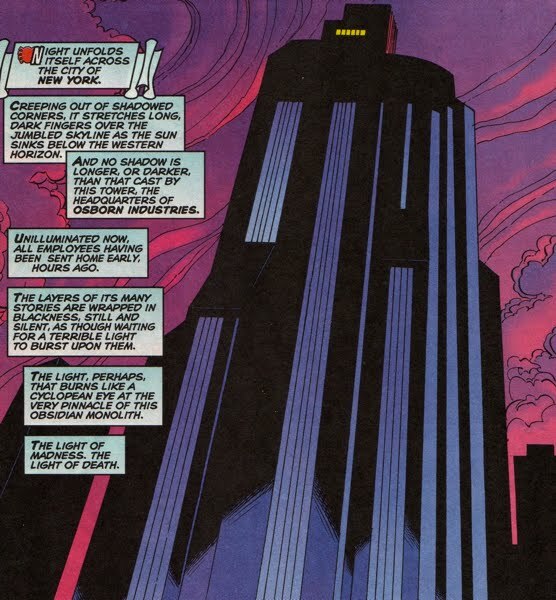 When Dan Slott (amongst others) took over the reigns on the Amazing Spider-Man title during Brand New Day, he preferred the use of Oscorp over Osborn Industries and he (along with artist John Romita Jr.) even brought back the company insignia 'O' that was first seen in the one-shot Tales of the Marvels: Inner Demons. The panel below is from Amazing Spider-Man #572. Brian Reed's four-part mini series entitled American Son added an interesting wrinkle to the Osborn Industries/Oscorp saga in 2010. 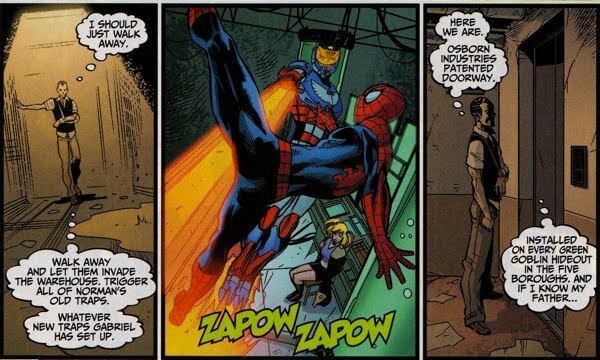 When Harry Osborn infiltrated his half-brother Gabriel Stacy's hideout in Crowne Heights, he reminisces over the 'Osborn Industries patented doorway'. 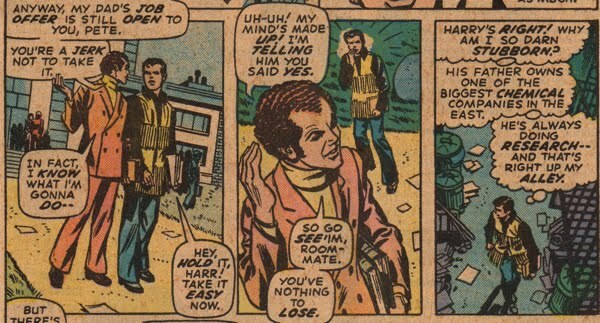 The hideout, which is revealed to be a property belonging to Norman Osborn, is depicted in the story as being an abandoned (and run-down) building. This is the first bit of evidence to the suggest that a possible in-story explanation for the company name is that Osborn Industries was the old name that was eventually replaced by Oscorp. But that is not the only potential explanation. 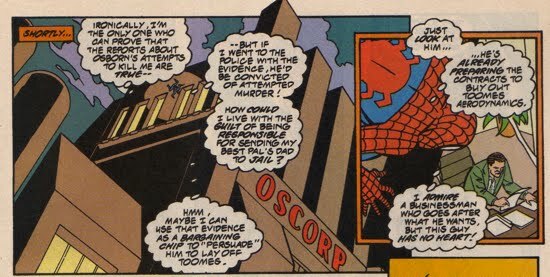 Since Oscorp is not specifically mentioned at all throughout the story, it could be that Reed was unaware of Oscorp and stuck with the more vintage Osborn Industries as the company name. 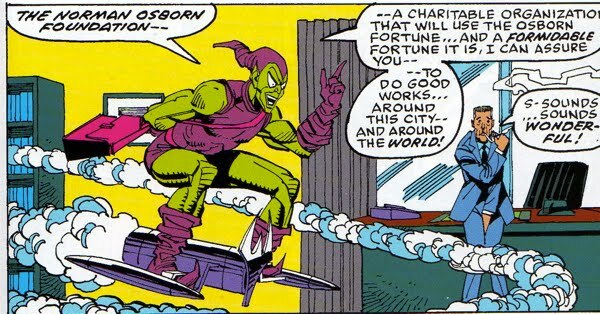 Either way, I'm pleased with the reference to Osborn Industries. The panels below are from American Son #3. A landmark event in the fate of Norman Osborn’s company, Oscorp, occurred in Superior Spider-Man #19. Liz Allan, alongside Normie, Mason Banks (a disguised Norman Osborn) and Tiberius Stone, celebrated the merger of Oscorp into Alchemax. The all-new mega corporation was comprised of “[Her] father’s company, Allan Chemical, merged with her son’s holdings in Oscorp…and the intellectual property of…Horizon Labs”. 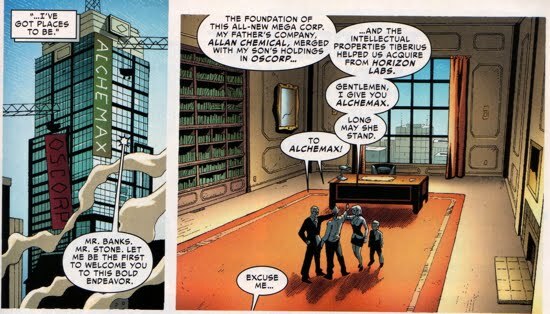 We know that Alchemax exists long in to the future, it is a company that Spider-Man 2099 is very familiar with because it controls numerous aspects of society during his time. Will this be the last reference to Oscorp/Osborn Industries??? This next one is really more of an honorable mention, since it comes from an Alternate Universe, specifically the Spider-Verse that emerged from the Secret Wars Warzone: Battleworld. 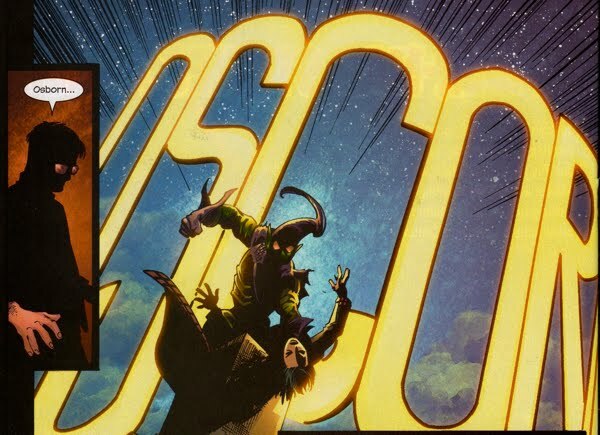 The panel below is from Secret Wars: Spider-Verse #1 and the Norman Osborn from this Alternate Universe named his company "Ozcorp"...with a z! There's a small resemblance between these two buildings, don't you agree?